The following was originally posted on Facebook by Marcia Boatright, a proud public school teacher from North Florida. It has been reposted here with her permission. Recently, I’ve seen multiple blog posts about what NOT to get your child’s teacher for Christmas. (I get that everyone who has a blog thinks they are the expert at whatever they’re blogging about at the moment…also, I get that they want me to click on any affiliate links in their expert blog post because they get a little money for my purchase). But not every teacher hates the things you’re telling the parents not to get. I may not still have every single gift I’ve received from a child since 1992, but I definitely have a memory of every child who selflessly gave me a gift. However, it’s a fact that I do still have many gifts I’ve received over the years. I still have my very first “My Favorite Teacher” ornament, and I still hang it on my tree each year. When I’m very old and can’t remember the giver’s name, all I’ll need to do is look at the back of it and be reminded of what a precious child she was. I have a box full of yellowed and dusty things, all from students who loved me enough to give me something, and every few years, I go through it and remember each one with special thoughts. I love apple stuff. And cheap hand lotions. And coffee mugs. And ornaments.To be honest, that gift that you saw on Pinterest and spent way too much time and money duplicating means less than the little Dollar-Tree-handmade-regifted-brooch-that-your-child-took-from-your-jewelry-box when you weren’t looking. I love it more because of the spirit in which it was given, not because mom read a blog post about what teachers really want for Christmas. You know what teachers really want for Christmas? We want kids who aren’t hungry. Kids who have shoes that fit. We desperately want world peace. We wish for kids to have grown-ups in their lives who act like grown ups. We want every kid to have a best friend. We want every kid to have someone to count on. We want happy children in our classrooms. We want hopeful children in our classrooms. If they come with an ornament or a cheap bottle of hand lotion, that’s even better. Don’t worry about the gift, parents. Worry about the giver and whether they truly understand the giving part. It’s then that we all win. I’ve already gotten my gift…I get to spend my days with amazing children. Today, on the last day of school before Christmas, I received among my gifts, a bottle of hand soap, a Diet Coke, some Cheetos, a picture painstakingly colored by a student (using only my three favorite colors), a cookie left over from a child’s lunch, a few hugs, a lot of fist bumps, and immeasurable joy brought on by the gift that is my students. As you can see our #FLedChat site has not had much attention in 2017. We are hoping to change that for 2018. Hence this experiment. For the upcoming chat, I am posting a Question Development Document (QDD) to be transparent in the types of questions participants may encounter during the scheduled chat. It is really just a list of the types of questions I may use when I moderate this week. It was designed to provide participants an opportunity to think in advance about the chat topic. I am very much against scheduled responses that allow participants to post a response but not actually engage in the conversation. We can do that on a padlet or a variety of other edtech platforms. However, I have also heard from many that they prefer to have the questions in advance so they can prepare their answers. In this world where online commentary can be scrutinized to the nth degree, I can completely understand this. There will be no times posted for the individual questions. In fact, I have no idea yet which questions I will actually use. That is always up to the participants and the direction they take the topic. We may go in a direction I never considered, making the QDD unnecessary. I hope this QDD will be a fair and reasonable middle ground for all involved. 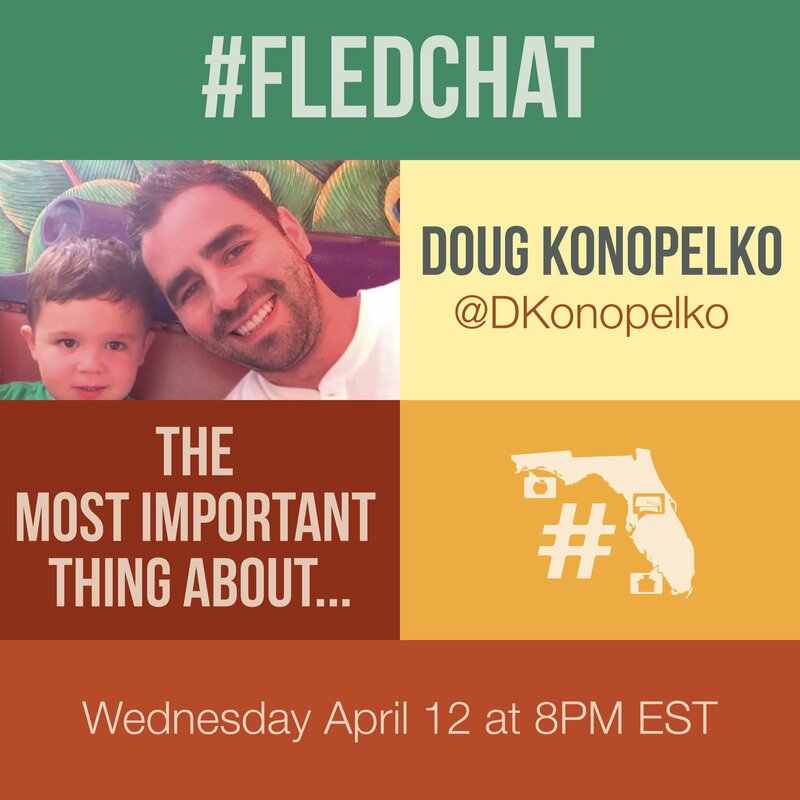 I also hope you give it a look, provide some feedback and support our desire to make #FLedChat better and more open to everyone. My apologies for those of you wishing to see these separated. Time got away from me.